Christian Bartolf is a Political and Educational Scientist (post-graduate, graduated with two University Diploma 1986 and 1987, Departments for Educational and Political Sciences, Free University Berlin, Germany). He has visited India (1985, 1998), Israel (1989-1997), Russia (1991-1995, 2000) and several European countries. He has served as a Counsellor for Conscientious Objectors and Director of the Peace Education Media Center for the Protestant Church District in Berlin-Spandau (Germany) (1991-1999) and the Ecumenical Center for Ecology, Peace and One World in Berlin-Spandau (since 2000). A professor of philosophy at the University of Maine, USA, peace activism has been a way of life for close to 40 years. An ardent admirer of Mahatma Gandhi, he has been active in the civil rights movement, the anti-Vietnam war struggle, anti-apartheid and feminist movements and more recently anti-Iraq protest. He continues to do Gandhi research, teaching, and service. In June he gave a Gandhi lecture at a peacemaking conference in Maine and another Gandhi lecture at an international conference in comparative philosophy in California. Recently, he completed a new study, "Gandhi After 9/11: Terrorism, Violence, and the Other," for a book he's editing entitled, 'Comparative Philosophy in Times of Terror'. 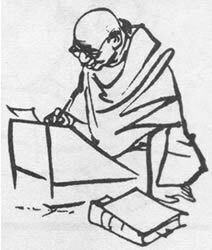 He is also editing another book entitled, 'The Philosophy of Mahatma Gandhi for the Twenty-First Century'.